After the rather rude and un-Hobbit-like way that his rowdy guests (or intruders) presented themselves at Bag End. it's little wonder that Bilbo Baggins took some time to read through the contract presented to him by Thorin Oakenshield and the band of Dwarves in his company. Declared fit for purpose by Gandalf the Grey. these Conditions of Engagement govern Bilbo’s role as Chief Burglar. Although unwilling to accept the role at first. Bilbo will prove his mettle when the time comes. A hefty document by any standards. we’ve shrunk the contract to 3:4 scale to create a more manageable. miniature prop replica. All text. including the fine print. is legible. 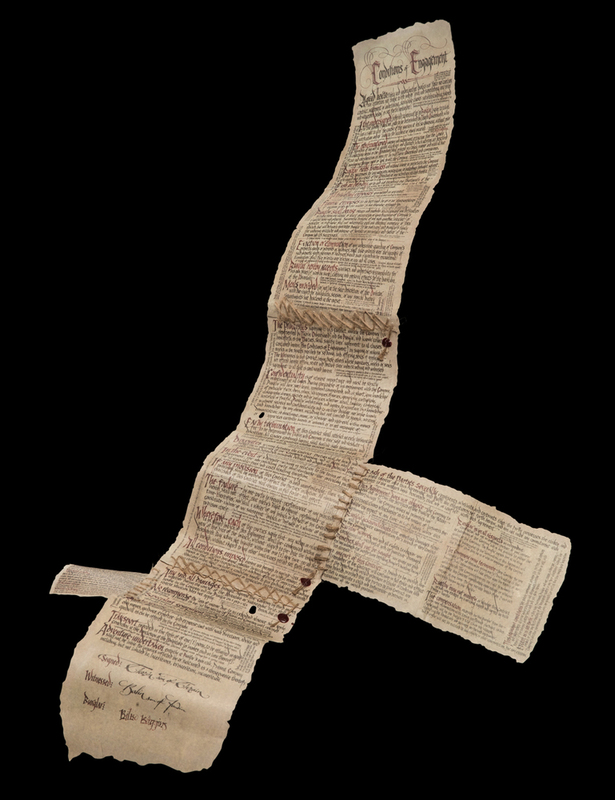 The Burglar Contract of Bilbo Baggins has been stitched together by hand. with the thread fastened by wax seals. Every crease and roll was duplicated from the original film prop created by the 3Foot7 Art Department. Find your contract tied with ribbon. rolled up in a Collector’s Edition cardboard box.